...but you have to promise not to tell anyone! Shh! 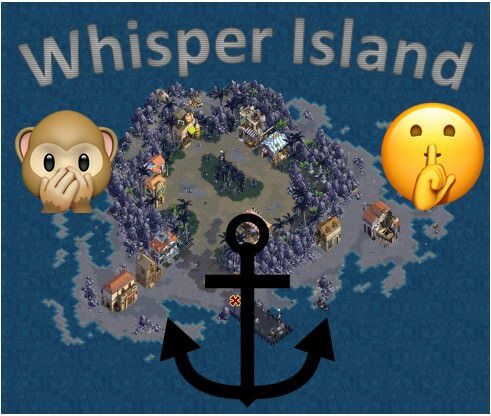 Anchor Issues will be blockading Whisper Island! The details are below, but keep it quiet! Theme: We will continue the naming theme on the island. Shoppes: The 2 current shoppes will be dusted unless the deeds are transferred to us. At the Shipyard we will repair from the blockade and then it set up for public use ensuring a fair cost for everyone. At the other shoppe we will ensure we have a constant supply of goods for the public. Tax: Taxes will be set at 15% to fall in line with the other islands on the ocean. Explorer's Hall: We will keep the Hall in tip-top shape. Hope to see everyone out supporting Anchor Issues! Best of luck to Brenda for an exciting blockade tomorrow evening. In all seriousness good luck tomorrow and clever intent. My posts are a reflection of my flags thinking. Except when they're not.